This post will look at the model from the last post in more detail. The error rate of predicting House District contests declined from 2002 through 2008. This implies that partisanship made more and more of a difference to voters over time. As partisanship became more important, Republicans held fewer and fewer House seats. The analysis was performed using a logistic regression of partisan registration difference as the independent variable and winner of the contest as the dependent variable for all Oregon House District contests from 2002 through 2008. The partisan registration difference alone can accurately predict 91% of the House contests from 2002 through 2008. On its surface, this is not that interesting. Put it another way, and it really stands out: campaign quality differences, campaign expenditures differences, and candidate incumbency factors, etc., among other facts, are only needed to explain 9% of the outcomes. This model holds during the great Republican year of 2002 and the “bad” Republican years of 2006 and 2008. The plann to move the 49er’s is significantly more familiar than the plan to move the A’s. This is only natural because the plan has been on the table for much longer. The survey consisted of 400 telephone interviews of 2010 likely Santa Clara Count y Primary voters conducted June 16-18, 2009. Quotas and/or weights were established by gender, age, party, region, and vote history as part of the turnout model. About half of the voters in the election were men and about half of the voters were women. In general, the Democratic districts became more Democratic and the Republican districts became more Republican. The partisan geographic split in Oregon has increased since 2002. There is a positive correlation of 0.59 which is statistically significant (>99% confidence the correlation is significantly greater than zero). 2002 Registration Difference: Republican registration percentage minus Democratic registration percentage. Registration Change 2002 to 2008: 2008 Registration Difference minus 2002 Registration Difference. The net equals the number of house seats held by Republicans minus the number of house seats held by Democrats. Generally, Republicans have consistently underperformed starting with the 2002 election. This graphic was constructed using the output of a regression of the Republican margin in House seats on the Republican margin in statewide registration. The expected number of House seats for each election year was calculated by plugging the statewide registration margin into the equation. 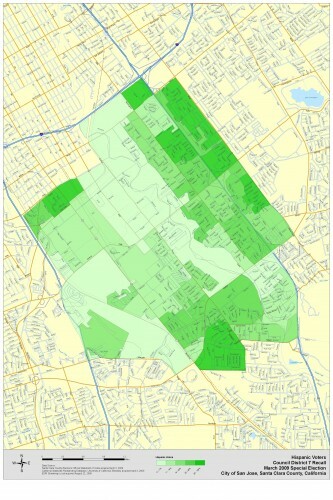 Non-Latino/Non-Vietnamese voters were most numerous on the outskirts of the district. There is a general correlation between Non-Latino/Non-Vietnamese voters and recall opposition. The votes by precinct are at: http://lindholmcompanyblog.com/?p=713. This graphic presents the middle 20 Oregon House Districts by partisan registration difference (Democratic percentage minus Republican percentage). Red districts are held by Republicans in 2008. Blue districts were held by Democrats from 2002 through 2008. Green districts switched from Republican to Democrat after the 2002 election. No district outside the current middle 20 switched sides during the period. The greatest movements towards Democrats in the Willamette Valley happened, generally, in the most Democratic areas: Corvallis, Eugene, and Portland. The Portland suburbs and Salem experienced the next largest shifts towards Democrats. 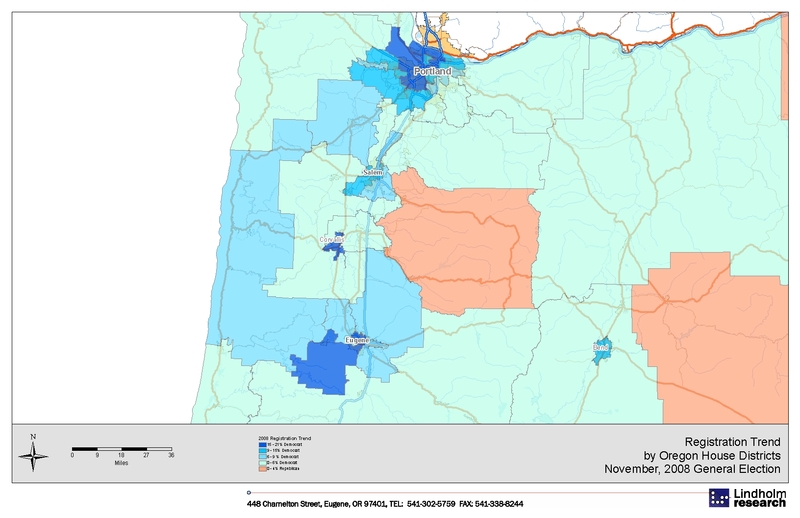 This map shows the relative changes in net partisan registration by Oregon House District between 2002 and 2008. 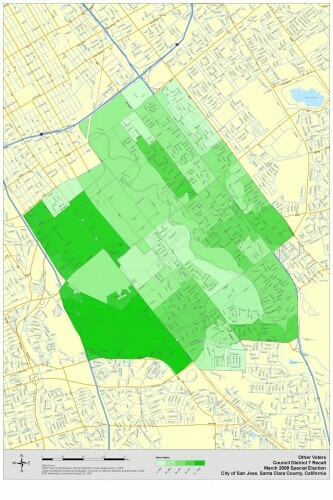 Latino voters were most numerous on the outskirts of the district. There is a general correlation between Latino voters and recall opponents.